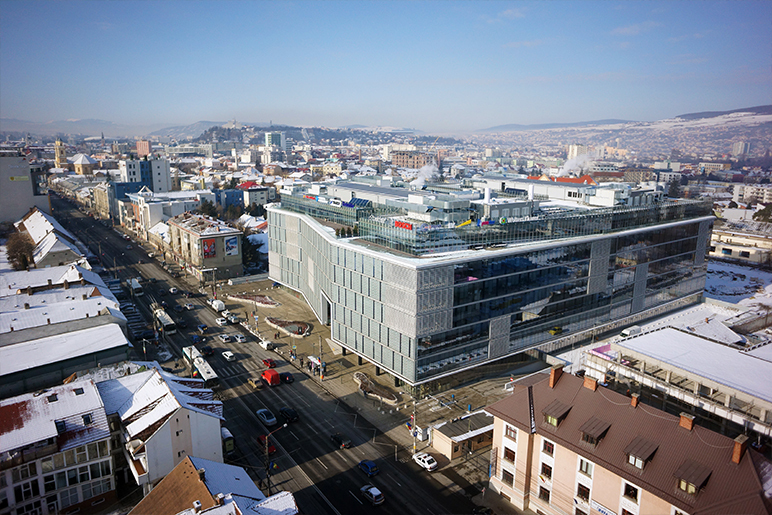 The second phase of The Office project in Cluj-Napoca, developed by NEPI and Mulberry Development, achieved the BREEAM Excellent certificate, with 80 points, the highest sustainability ranking for an office building outside Bucharest and second highest in the country. BuildGreen managed the certification process. BREEAM certification acnowledges The Office as a best practice example for sustainable design and demonstrates the leading development vision of NEPI and Mulberry Development. The Office comprises three office buildings with a total GLA of circa 60.000 sq.m., located in a central area of Cluj-Napoca which is now seen as the new business district of the city. At present, the first two buildings are finalized – phase I and phase II – totaling a leasable area of 40.700 sq.m. The third building is under construction and will be delivered in the summer of 2017. Once this last phase of developmet is completed, The Office will become one of the biggest business locations in the city, hosting over 5.000 employees. The Office‘s list of tenants include 3Pillar Global, Betfair, Bombardier, Bosch, Corporate Office Solutions (COS), Deloitte, Ernst&Young, HP, Leoni, Lohika Systems, National Instruments, TUI, Wolters Kluwer, Yardi, Yonder. The project also comprises aretail and services area, including tour operatorTUI, La Casa coffee shop, Office Winebar and Hugo restaurant. „The Office is a special project, through which we aim at offering our tenants not just an exquisite workspace, with superior design and best-in-class facilities, but also a modern and sustainable environment for all who pass its doors. We managed to povide Cluj with an innovative space, whose high construction standard we wish to maintain, so this second certification is a natural step in the project’s life”, states Marius Barbu – Asset Manager NEPI. ”Through this certification, The Office marks a double success – achieving one of the highest sustainability levels in Romania, but also one of the fastest assessment undertaken so far by BREEAM experts, their prompt and undoubted answer confirming the high level of execution of this sustainable project. The Office is the most modern office space Cluj-Napoca has to offer at this moment, which trully incorporates all sustainable requirements that lead to a high energy performance. Moreover, its excellent location and access to numerous facilities and transport solutions represented two other key advantages in sustainable assessment, proving that the project benefits of all premises to create an important class A business community within the city ”, explains Răzvan Nica, Managing Director of BuildGreen. “Since starting this project, we have been focusing mainly on its energy performance, which will generate a significant competitive advantage: low maintenance costs and annual savings for tenant companies. The BREEAM Excellent certificate recommends The Office as the greenest building delivered to date outside Bucharest and confirms our reputation as sustainable developers”, concludes Ovidiu Șandor, owner of Mulberry Development. The certification of The Office started in 2013, when Phase I became the first project outside Bucharest to reach the BREEAM Excellent ranking. The performance registered once again by the second phase consolidates The Office’s position among the most sustainable buildings in Romania. BuildGreen assisted the developers from the start, offering consultancy and assessment services in line with BREEAM requirements, advice for sustainable design and acquisitions, as well as BREEAM strategy definition, thermal and energy modelling, life cycle costing and life cycle assessment, building acoustics services.